Han Lin, Senior VP, Deputy GM, Wells Fargo China and Chair of the Finance Services Committee kicked off the event by introducing the speaker and the panelists (see their detailed bios at the end). 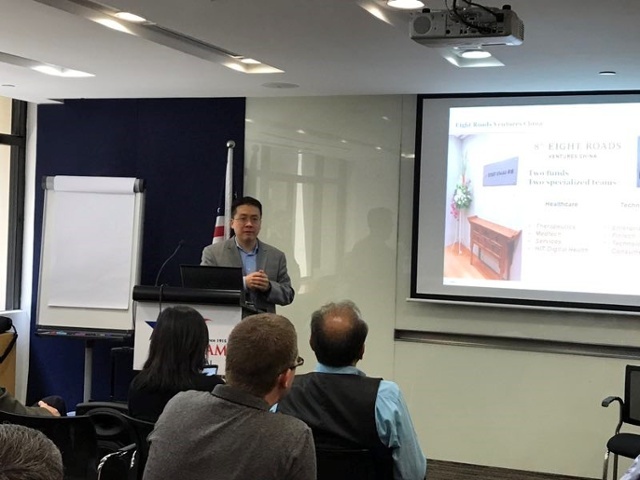 Joe Chang, Partner at Eight Roads made the keynote presentation sharing his views on emerging trend in the rise of innovative Chinese IT ventures. After the presentation, Brett Krause, Managing Partner at PurpleSky Capital and Dave Jones, President at SPD Silicon Valley Bank joined for a panel discussion and interactive Q&A facilitated by Dr. Hugh Rashid, co-chair of the Tech & Innovation committee. 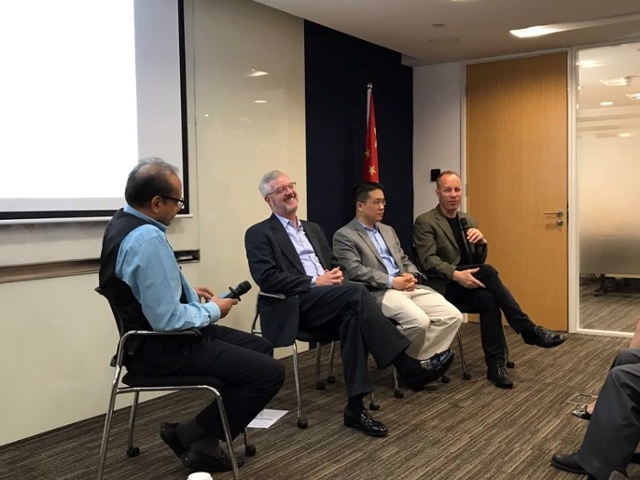 Joe shared a novel perspective on the dynamics of IT needs and opportunities for new type of firms in the large enterprise space in China. Joe built a strong argument for a perfect storm that will likely help Chinese tech firms create a dominant global position over the next decade and hence his focus for technology investment in the enterprise space in China. 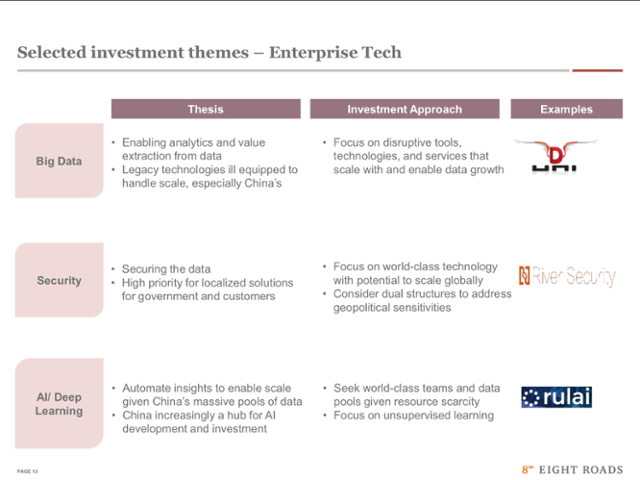 Some of these insights come from the fact that Eight Road is associated with Fidelity Investments which has a long history of tech investments in China. In fact, they were the lead Series A investor in Alibaba back in 1999 and remain one of their largest shareholder. Over the last 20 years, many Chinese went to the US and Europe for advanced studies in computer sciences. After receiving their PhD, they often got picked up by leading software and hardware companies. Over the years, they progressed and many have reached senior technology leadership roles (CTOs, VP Engineering etc.) in top global high-tech firms, both in hardware and software sectors. One of the main reasons these top Chinese professionals stayed abroad after completing their education was that there were no good high-tech jobs in China at the time. During the first two decades of the opening-up policy, China was mainly focused on building a base for low-cost manufacturing using low-tech strategies and invested very little on modernizing their IT infrastructures. But two developments have dramatically changed the situation in favor of the enterprise IT market in China – both from the enterprise customer demand side as well as the supply side of talent and new local enterprise-focused IT ventures. Edward Snowden and related incidents have exposed the threat that nations face in terms of data and information security, As a response, China has committed to a long-term national policy of creating indigenous technologies in each of the major categories – from semiconductor chips to networking hardware to security software to big data to robotics and artificial intelligence. These national security issues, have also created the IT challenge for many large local enterprises, such as banks and telecoms, who are being discouraged or even prohibited from buying foreign technology equipment (especially from US firms) for national security concerns. This has created a huge vacuum in the local Chinese enterprise IT space attracting seasoned Chinese tech executives to return home and start ventures to deliver advance technology products to these large Chinese corporations (especially Banks, Telecom, other SOEs etc.) who are in desperate need for high quality local IT technologies. A parallel phenomenon fueling demand of enterprise IT has been the explosive growth of electronic consumer devices and B2C business models in China. In fact, currently most of the Venture Capital money is focused on exploiting consumer opportunities (social media, games, food delivery, ride/bike sharing etc.) considering the sheer size of the Chinese market in each of the consumer categories. However, as the Chinese economy has grown so has the size of its enterprise firms. In fact, Chinese banks are now some of the largest banks in the world. Same with the telecom companies that have grown dramatically with the rise of mobile digital devices. These companies have tremendous need to manage the data they are collecting, securing their digital assets and modernizing their IT platforms to better service their highly digital and mobile customer base. From not investing much in IT a decade ago, they are now one of the fastest growing sector and offer huge opportunity for Chinese entrepreneurs and Venture Capital investors who understand how to operate in the enterprise IT space. There are many reasons for the increase of Chinese executives returning or thinking about returning back to China besides money and fame and include: 1) sense of helping their motherland they have been away far too long, to being closer to their aging parents or grandparents, 2) to having their children getting some exposure to the local Chinese culture, 3) to getting a shot at the top leadership role after they have hit a glass sealing with the US tech firm, 4) to generally being in an environment which is more welcoming and hungry for their talent, 5) to being able to establish top level personal relationship with CEOs and CIOs of some of the largest Chinese firms. Passion for technology coupled with opportunity to build a world-class Chinese company from ground up at lightning speed can be very rewarding both professionally and financially and so will likely attract waves of Chinese executives who may have reached their highest technical stature in their field in the US and now want more that China is ready and willing to offer. With the huge market size, intense demand, high quality talent in terms of returnee Chinese executives, and plenty of money available (both from VCs and the giant Chinese enterprises), enterprise IT space is ripe for a quantum shift in its growth curve. In fact, with Chinese government fully behind the technology localization strategy many international funds are ready and willing to fund these tech ventures both for the local Chinese market and later to help some of these firms to go aboard and build global Chinese high-tech brands in the enterprise space. Over the next 10 years, we can expect Chinese tech firms playing a dominant global role in almost all categories of technology. Most of the firms are going to use the favorable advantage they have in China to capture the local market to reach a critical size and then go global. Since these firms will be led by Chinese executives who have had top R&D jobs in leading us firms they are very familiar with what they are up against, since in many of the cases, they were the chief architecture of those technologies. They are now building the next generation of technologies as Chinese entrepreneurs and are hungry & passionate about leading their companies to a global leadership position in the tech sector. Modernizing IT infrastructure is of course the basic starting point for most enterprises in China so that they have a solid foundation to build on. This foundation will need high security, ability to manage big data and strong AI/Deep learning capabilities to gain actionable insights. These three areas alone are huge opportunities for enterprise focused startups and in the core focus on Eight Roads in China. One case study that brought this to life is the story of River Security venture in China. Xu Ming, the founder and CEO was the Vice President of Symantec who built their R&D Center in China into their most advance research center. 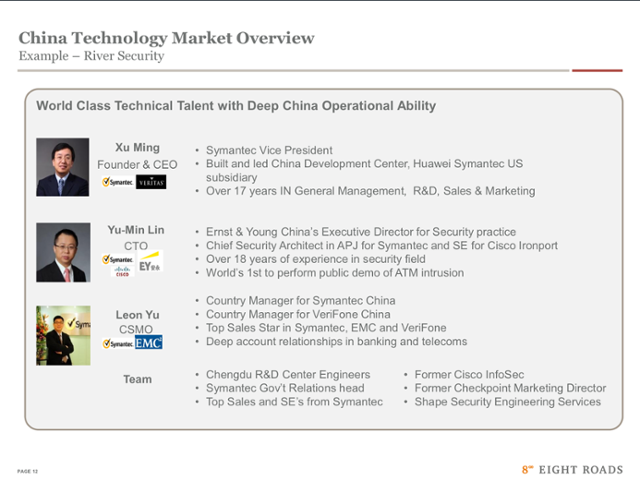 When, under pressure from US government, Symantec wanted to shut down the Chengdu research center and move the team back to the US, the team lead by Ming (see below), decided to stay back and start their own venture to service the exploding security market in China. Since the team had impeccable technical credentials and had strong business development relationship with leading Chinese firms, they grew rapidly and now have attracted attraction of many international VCs like Eight Road who see the global potential of cutting edge products that River Security is producing. Bret from PurpleSky clarified that their model is to invest in early stage startups in the consumer space. This is still a huge growth areas for the huge Chinese market and will continue to create opportunities for entrepreneurs and VCs. He mentioned they have been fortunate to get dozens of business plans a week and feel there have lot of opportunities to choose from in the growing Chinese consumer space. David from Silicon Valley Bank pointed out that they do not play the role of VC but are more of a traditional bank that understands the unique financial needs of growing tech firms. 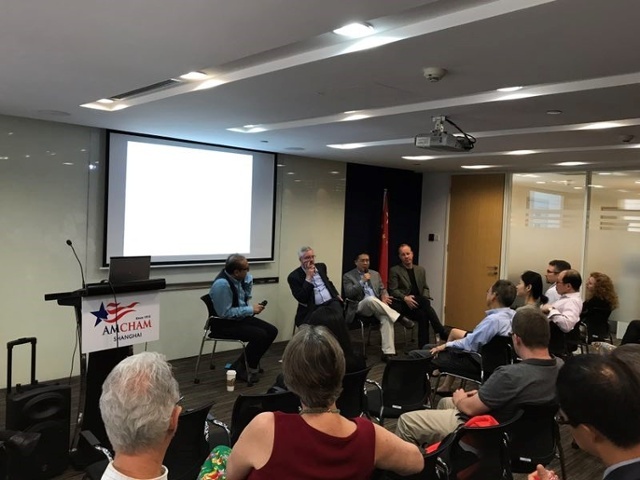 They want to be a partner to tech industry in China and leverage their years of expertise in California to help emerging Chinese tech firms with short-term and long-term capital requirements to help fuel their growth. Answering one of the audience questions, Joe clarified that unlike the consumer-focused ventures which are often all or nothing gamble where winner takes all, the business-to-business IT market provide a more stable journey with various exit options besides the IPO event. Such firms get attractive lucrative buyout options along the way, as they complete the core technology and have it deployed with few reference enterprise customers, rather than just waiting for IPO to cash in. Also, Enterprise IT ventures are very different from consumer tech ventures in many respects. First, the leadership role requires deep technology expertise in the narrow area the startup will be focusing on which often comes from years of working in senior technical leadership roles in that area. Second, between the VC and the startup team, they need to have strong relationship with CIO level executives at major enterprise firms they will be targeting as their early adopter customers. Considering that enterprise customers, particularly the CIOs of these firms, are very conservative when it comes to adopting new technologies from new startup firms (which may or may not survive mid to long-term) it is not easy to get them to accept your beta or even the first production version of your new product. New technology has to be far superior than their other choices and there needs to be tremendous trust in the leadership team building the technology as well as the VC firm that is backing the venture. This dynamics alone narrows down the type of firms that can emerge to take advantage of the enterprise IT opportunities as well as the VC firms who can act as a catalyst and a become a value-added partner. In response to a question about general lack of commitment or sophistication towards IT investments by local Chinese firms, Joe explained that this phenomenon is largely with the firms under $1B revenue size since they are mostly focused on short-term survival issues and not thinking too strategic in their technology investments. The situation is very different with the enterprise firms (Banks, Telcos etc.) who are loaded with cash and have accelerated their digital transformation effort for two key reasons: 1) They had neglect modernization for a long time since the opening-up policy and now are in desperate need to tackle the massive amount of data they are having to manage and service their growing tech savvy mobile customers, 2) The pressure to meet the national security requirement for data protection is huge as government has tremendous clout over large enterprises in such sensitive matters. Upon question of how to choose the right VC among the thousands of VC funds in China, Joe clarified that most of the funds can be considered dumb funds since most VCs in China don’t have the sophistication, either to evaluate what they are investing in, nor the ability to help startups grow and prosper through coaching, industry connections or trend insights. For most of the VC funds, it is like placing bets and hoping that some will pay off. These are the type VC firms that the Joe recommends against in favor of more smarter funds that are well connected in the industry and can actually help the firm with product strategy, customer access and future rounds of funding when needed. For the enterprise IT space, the right VC partner is critical since the market dynamics are completely different from the consumer space for the following reasons: 1) Enterprise customers have complex IT requirements, 2) Customers are demanding in the technology selection decisions due to enterprise risks involved, 3) They are conservative when it comes to working with new firms due to concerns that they may go not be able to survive over the long-term, 4) The enterprise sales cycle could take a year or more and requires having access to senior level technology leadership of these enterprise firms, 5) The professional industry credibility of the technical team behind the product and the sophistication of VC backing the venture is of utmost important when it comes to new technology in a mission critical areas of the business. With accelerated demand for enterprise IT technologies, especially as the digital transformation of traditional industries continues, there are many mega investment funds entering the picture not to mention the accelerator programs being launched by most of traditional hardware and software IT vendors. Many traditional IT vendors have come to realize that for them to be relevant in the digital age, they need fresh ideas and fresh technologies and need to engage with startup community as well. Digital transformation underway across all the industries has put IT technologies at the center of business strategy rather than operational necessity. IT technologies will be embedded into products whether it is manufacturing equipment, cars or other products or services that the enterprise produces. It is creating a need to large firms to partner or acquire firms that understand their industry and have unique technology that can give them competitive advance. In fact, many enterprises in traditional industries, such as auto & retail, are launching their own accelerator programs to better connect with the tech ecosystem – investing and acquiring new tech firms that have enterprise-scale technologies (Ford and Walmart are notable example with the press coverage they have been getting for their recent aggressive moves). This trend will likely to continue creating further opportunities for new breed of startups focused on core digital technologies that large enterprises will need as part of their digital transformation strategies. The traditional IT vendors servicing enterprise customers for decades are under pressure to justify their unique value-add when it comes to the future digital platforms. Companies like Google, Facebook and Alibaba do not use hardware or software from these traditional enterprise IT vendors and consider them old generation technologies – clunky, expensive and rigid. For example, EMC is the gold standard for reliable storage but most of the mega platforms in the consumer space don’t use them, and yet, are able to provide high level of reliability and performance. Same goes for the server hardware since most of these platforms use cheap machines configured and architected in a way that collectively scales much better than the largest mainframes and provide unparalleled redundancy and high availability. Large enterprises (in particular Banks and Telcos) have begun to take notice of the huge volume of data and consumer activity that these mega platforms (Alibaba, Amazon, Facebook etc.) handle in a reliable manner without need for these traditional IT vendors. This has opened the window for new breed of software and hardware vendors to disrupt the grip of the traditional enterprise IT vendors. This disruption of traditional IT vendors is a global phenomenon but as China pushes for indigenous technologies these new ventures have an opportunity to leap-frog the legacy platforms and build enterprise scale technologies with fresh look at the modern technologies that are fueling the mega platforms on the Internet. Joe clarified that even though all this investment activity in the enterprise tech industry this will create competition for talent and technologies, by and large there is more cooperation in the enterprise space than cut-throat competition we see in the consumer space. This is largely because enterprise customer needs are complex and requires tremendous integration and cooperation between different vendors and technologies. It is in the interest of the tech companies (especially venture back startups) in the enterprise space to cooperate so that their technology is a good citizen of the overall enterprise architecture and works well with existing technologies of the entrenched enterprise IT vendors who could be a potential partner or investor in the future as well. The overall trend and opportunities for enterprise IT investment in China that Joe painted are indeed very compelling and provide some exciting opportunities. Before other investors start banking on this strategy, couple of cautionary points to keep in mind when one looks at a slightly longer time horizon. One secret weapon the America has is its university system. One could argue that it may be even stronger than its military might when it comes to being ahead of the world. In fact, many Chinese scholars have tried to come back and help the Chinese universities but find it difficult to even engage let alone change the culture. These scholars (often with world stature and at top of their academic fields) are considered a threat to the establishment and many leave after frustration with how research funds are allocated or how professors are incentivized and promoted. Being associated with leading Chinese scholars in the US and having done work with leading Chinese universities over the last seven years, I have heard enough real stories to consider this a serious issue. In fact, the recent scandal of the fake peer-review research papers is but a small example of the deep rooted systematic problems that will take decades to change. Till that time, US will remain the world destination for cutting edge research in most tech fields and continue to attract the best brains for PhD and tech ventures that get born out of such research. Joe mentioned how Eight Roads is betting on the Chinese executives to return to China and start high-tech ventures focused on the IT enterprise space. This niche focus has indeed lot of potential in helping these seasoned Chinese executives leverage their existing knowledge to create leading-edge products for the Chinese enterprise market. Products that are not only advanced in performance but also address the long-term national security goals of China. One question that remains is how long this leverage of past knowledge will continue considering the challenges that Chinese universities face when it comes to creating new knowledge. If these returned Chinese executives don’t find the tech ecosystem that they can draw upon, then the “knowledge well” they bring with them can likely dry up and affect future generation of the products they design and build in China. Another danger is that they may miss the intellectual collaboration with universities and like-minded tech experts (the magic of Silicon Valley) and return back to the US after a decade or so. These things are hard to predict but a case can be made that the traffic of Chinese executives cannot be assumed to be a one-way street or assumed to last long enough for some of these Chinese ventures to become global Chinese tech giants. But of course, these are the type of calculated bets sophisticated venture firms make. Also, the history of US is the history of change. Even though there may be a glass ceiling for Chinese executives, that ceiling may disappear as the next generation of Chinese executives get much more culturally integrated both socially as well as through their command of English and their ability to engage with the investor community in CEO roles. These future Chinese tech leaders may find the CEO leadership role in the US and may indeed build global firms right in the US rather than having to returning to China to pursue their ambition. This is especially true as English language is now much widely diffused in the Chinese middle school and high school systems and by the time these young Chinese go abroad for university studies they may be far ahead of their predecessors and may not necessarily feel the English language handicap of the previous generation. Due the genuine national security concerns it is very clear that China is well on its path to localization of critical elements of the technology stack (network equipment, semiconductor chip, security software, critical hardware components for storage, servers etc.). To implement this localization strategy, it needs the best Chinese IT technology experts who largely residence in the US. In the short-term China needs them more than they need China. How this marriage of immediate necessity translates into long term ambitions of VC investors to see the rise of Chinese IT global giants is hard to predict. Localization of technology stack to remove dependency on a similar foreign technology is very different from creating entirely new categories of hardware and software that the global enterprises may want that no other global IT vendor can provide. Digital transformation of traditional industries will open-up exactly such opportunities, but it not clear how well the local Chinese firms will be able respond, especially if such opportunities have less to do with national security and more to do with being part of the global technology ecosystem (flexible partnership with other foreign firms, foreign universities and global talent pools). However, as the two leading economies of the world, both China and US are likely to dominate the tech industry over the next decade or two even though their trajectories and what they bring to the table may be different. Investment bets in both markets are likely to pay off for enterprise savvy VCs who can find and back experienced tech executive-turned-entrepreneurs who want to build next generation of IT technologies and platforms that the enterprise customers will likely need for their enterprise-wide digital transformation of businesses. For example, Chinese Intelligence Manufacturing 2025 vision and one-belt-one road can provide growth venues that alone may be enough to create mega billion-dollar Chinese IT enterprises without the need for global leadership, which is hard to predict, but can emerge over much longer time horizon through flexible collaboration and cooperation with other international tech firms, international universities and international industry consortiums etc. (active participation in the global technology innovation ecosystem).